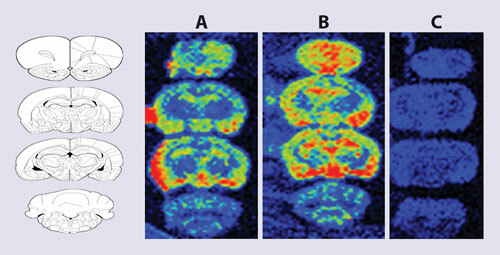 Molecular imaging is broadly defined by the Society of Nuclear Medicine as “the visualization, characterization, and measurement of biological processes at the molecular and cellular levels in humans and other living systems.” It is used extensively in drug discovery and development, for diagnosis and to monitor the efficacy of therapies. With so many modalities, from CT and PET to ultrasound and MRI and compounds, from radiolabeled pharmaceuticals to fluorescently labeled small molecules to dense contrast agents and players in the field, it was inevitable that “In Vivo Molecular Imaging in Drug Discovery and Development” would draw a diverse slate of speakers. The June meeting brought those working on the physics and chemistry of probe construction together with clinician-scientists, to discuss current issues in and future directions of the field. Through its Clinical Trials Network, the Society of Nuclear Medicine is working to forge order out of all that chaos. Click here for more. A common theme among the conference’s participants is that development of molecular imaging agents should start early in the drug development process. According to Juri Gelovani, M.D., Ph.D., president of the Academy of Molecular Imaging, this should happen as soon as a clinical target is locked in, perhaps even preceding development of the therapeutic itself. Whether it’s measuring target expression levels or levels of receptor occupancy and determining pharmacodynamics or pharmacokinetics, the effects of biological approaches need to be validated in parallel to drug development in order to allow for timely transition into the clinics, concurred Thomas Krucker, head of molecular imaging for the global imaging group at Novartis Institutes for BioMedical Research. Co-development of the drug and diagnostic together would save time and resources. Molecular imaging should be integrated with the drug discovery project teams, rather than run like a core service. At Novartis, he said, they develop customized solutions that use imaging to seek information that can’t be found through other technologies. Labeled biopharmaceuticals are an obvious source for imaging agents, Krucker said. Yet many biologicals display properties such as slow clearance and low target to background ratios, and because of their large size they may suffer from low stability or poor tissue penetration as well, making them less than ideal for the purpose. These issues can sometimes be addressed by engineering the proteins into smaller formats, for example Fab fragments or diabodies, instead of intact monoclonal antibodies. Imaging agents, as compared to doses of therapeutic agents, are administered in very low amounts that don’t induce pharmacologic effects, added Dr. Gelovani. They should provide quantitative information about the spatial distribution and magnitude of drug-target expression and activity in tumors as well as other normal organs and tissues. Of course, sometimes the imaging agent should be as similar to the therapeutic agent as possible—especially if the goal is to track the therapeutic agent itself. Stephen Mather, Ph.D., professor at Barts Cancer Institute, Queen Mary University of London, has been concentrating his efforts on using a variety of preclinical imaging modalities to optimize compounds destined to become pharmaceuticals. His presentation, sponsored by BioScan, focused on research using that company’s dual-mode NanoSPECT/CT system. In vivo preclinical imaging in animal models, he said, can help to identify much earlier in the process whether a drug is likely to ultimately be successful in patients. His lab collaborates with GlaxoSmith-Kline on a project to target interferon (IFN) to the liver. IFN is known to be effective against hepatitis C infection, but because its receptors are present throughout the body, systemic delivery results in considerable side effects including hallucinations. They also collaborate with several other academic labs across Europe in a program sponsored by the EU’s Cooperation in Science and Technology program. The study compared which of nine different radiolabeled peptides seemed to best target a receptor found on medullary thyroid cancer. “This allows just one compound to be taken forward into clinical trials, which are increasingly difficult and expensive to do,” Dr. Mather explained. Researchers at Queen Mary University are using a variety of preclinical imaging modalities to optimize compounds destined to become pharmaceuticals. A SPECT image of the uptake of a radiolabelled peptide by a tumor (on the right) and kidneys overlaid on a CT scan of the mouse skeleton is shown. While in the molecular imaging group at AstraZeneca, Dr. Maier’s team worked on the a-7 neuronal nicotinic receptor (NNR)—an important target for psychiatric and cognitive disorders such as schizophrenia and Alzheimer disease. They would pretreat an animal with a drug compound before administering a radiolabeled ligand, and then dissect the brain at various time points. When one particular ligand was used, they found what seemed to be a paradoxical decrease in receptor occupancy by the microgram dose of the pretreatment compound, in which there were more receptors available for radioligand binding. “You’re actually increasing the receptor density at the neuron and you’re increasing the binding of the radioligand—and so it results in a mathematically negative receptor occupancy,” Dr. Maier explained. A typical molecular imaging probe, such as a fluorescently labeled antibody, is introduced into a subject (animal, patient) and washed out over time. Contrast is achieved by maximizing the amount of signal at the target while minimizing that remaining associated with nonspecific tissue. A host of factors, from uptake, metabolism, and clearance of the probe to interference by endogenous factors (e.g., autofluorescence) to sensitivity and selectivity of the probe to timing of the imaging, can impact the achievable signal to noise ratio (called tumor to background ratio or TBR in oncology). Most currently available probes are “always on”—that is, they continuously emit signal (or in the case of fluorescently labeled probes, they always fluoresce in response to excitation). The targeting moiety should direct most of it to the organ, cell, or receptor of interest, yet TBR often remains an issue. What if a probe only emitted a signal when associated with its target? asked Hisataka Kobayashi, M.D., Ph.D., chief scientist in the National Cancer Institute’s molecular imaging program. Dr. Kobayashi has been working on “activatable” probes that respond to biological processes. In one example, quenched fluorophores are conjugated to tumor-specific antibodies. Once bound, the probe is internalized where it can be activated by the acidic environment of the endolysosome. Although fluorescent imaging is typically limited to very shallow depths, it can be used to guide open surgery—for example, in the brain—and most parts of the body (except the heart and brain) can be reached by using endoscopy as well. “We can go almost anywhere through the GI or urinary tract, or peritoneal or plural spaces,” Dr. Kobayashi pointed out. Dr. Gelovani, who also leads the development of molecular imaging agents at the Center for Advanced Biomedical Imaging Research at the University of Texas’ MD Anderson Cancer Center, wants to see molecular imaging used more as a means of early detection of cancers, as well as a way to stratify patients based on unique mutations or genomic or phenotypic abnormalities. Take, for example, small-cell lung carcinoma patients whose tumor is dependent on a mutation that locks the tyrosine kinase part of the epidermal growth factor receptor (EGFR) into a particular dominant active configuration. Such patients respond positively to therapy with EGFR inhibitors. “We have explored the chemical space of that configuration and developed a particular molecular imaging agent that would have selectivity for that particular activating mutation and irreversibly bind to that dominant active EGFR kinase,” said Dr. Gelovani. Molecular imaging can seek out its target wherever it lies, is quantitative, and (because it’s noninvasive) can serially query the same target. A biopsy, on the other hand, only reveals a mutation where it is sought, which because of the tumor heterogeneity often does not represent the rest of the tumor and metastatic tumor lesions. In contrast, molecular imaging can aid the characterization of tumors in the whole body at once. Yet, not all scans—not even all PET scans—are created equal, and this has implications for the interpretation of clinical trials. “The problem is not so much that the drug is different, but that each center does the scan in its own particular way. Their equipment is calibrated in their own way, and radiologists interpret the study in his or her own way,” observed Peter Conti, M.D., Ph.D., co-chair of the Society of Nuclear Medicine’s Clinical Trials Network (CTN). At the same time, drug companies may be pretty naïve as to how to structure the protocols, the University of Southern California professor continued. “So there’s a tug of war between the right way to do it as per the radiologists and the right way to do it as per the drug company,” leaving the FDA with the problem of not being able to compare the studies. Basic parameters need to be optimized and standardized. “We can argue about which way may be better than the other, but we have to agree at least on some baseline,” Dr. Conti said. From there, it’s a matter of education and training. Progress, he said, has been good. Manufacturers are trying to come up with common analytical methods so that data is transparent as to which device was used to generate it. More than 300 imaging sites worldwide have begun the process to join the CTN imaging registry, and over 100 have been qualified. More than 60 scanners have been fully validated. Cyclooxygenase 2 (COX-2) is an important inflammation marker that is also involved in tumor development and progression. Aberrant induction of COX-2 and upregulation of the prostaglandin cascade play a significant role in carcinogenesis. Blockade of the process has strong potential for cancer prevention and therapy. Blockage of COX-2 activity either by nonselective COX-2 inhibitors, such as aspirin and ibuprofen, or by selective COX-2 inhibitors, such as celecoxib, reportedly reduce the risk of human cancer and precancerous lesions at all anatomic sites thus far investigated. Fluorocoxib A is a recently developed fluorescent probe that can specifically target and inhibit COX-2. Scientists at Caliper Life Sciences (www.caliperls.com) recently evaluated the COX-2 binding property of this probe both in vitro and in vivo with fluorescence imaging. Multispecral tissue fluorescence microscopy from the company’s Nuance imaging system showed that the Fluorocoxib A probe exhibited specific binding to COX-2 expressed in HT29 colon cancer cells but not to HCT116 colon cancer cells, which lack COX-2 expression (Figure 1). Figure 1. In vitro binding of the Fluorocoxib A probe to COX-2 positive HT29-luc2 cells was shown after imaging with NuanceFX. Staining of the cytoplasm by the probe was displayed in red. Nuclei staining with DAPI was shown in black. Control COX-2 negative cell line HCT116 lacked staining by the Fluorocoxib A probe. They further evaluated Fluorocoxib A in vivo. They established subcutaneous tumors with both HT29 and HCT116 colon cancer cells. Following tail vein injection of the probe, they were able to detect specific targeting of the HT29 tumors, but not the COX-2 negative HCT116 tumors (Figure 2). Quantification of fluorescence signal from tumors showed that fluorescence detection was the highest at 3 hours and declined substantially at 6 and 24 hours. The HT29/HCT116 ratio indicated that the signal from the HT29 tumor was twofold above the background signal in comparison to the HCT116 tumor at the three and six time points. Figure 2. Nu/Nu mice were s.c. injected with 2×106 of HCT116 (left flank) and HT29 (right flank) tumor cells. Most of tumors were approximately 100 mm3 at day 16, when mice were injected with either Fluorocoxib A probe (2 mg/kg, i.p.) or control 5-ROX dye. Mice were imaged at 3, 6, and 24 hours after injection with IVIS Spectrum (Ex570, Em640). Images shown were taken at three hours. 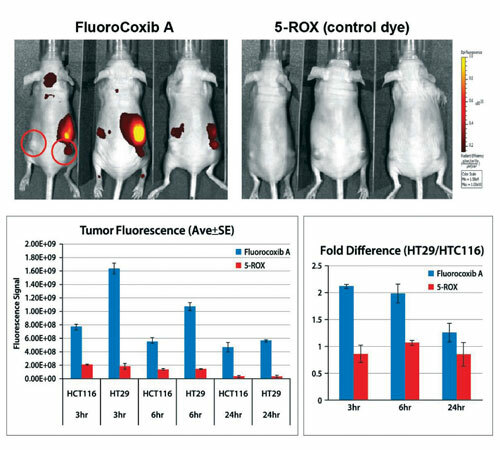 COX-2 positive HT29 tumor showed preferential labeling by the Fluorocoxib A probe whereas the COX-2 negative HCT116 showed very little binding. Quantification of fluorescence signal from the tumors showed a steady decrease of the fluorescence signal at the 6 and 24 hour imaging time points. A twofold difference between the COX-2 positive HT29 and COX-2 negative HCT116 was observed in Fluorocoxib A injected mice at 3 and 6 hours.